Internal Lebanese politics have long influenced relations with Israel. Excerpted with permission of JTA. Instead of the hoped-for oasis of peace tied to the Jewish state by a wealth of common interest, Lebanon has proven in recent decades to be a deadly arena of bloodshed and war. First it was the Palestinians who used the country as a launching pad for terrorist actions against Israel; then it was the Shi’ite Hezbollah. In both cases, outside powers used the militias as proxies against Israel; and, in both cases, cross-border violence eventually led to war. Fifty years ago, things looked more promising. In the mid-1950s, Israel’s first prime minister, David Ben- Gurion, had visions of peace with an independent Christian country in Lebanon. In February 1954, he wrote to Foreign Minister Moshe Sharett, urging him to take diplomatic initiatives toward the establishment of a Christian enclave. Ben-Gurion hoped to create a coalition of like-minded religious minorities in the predominantly Sunni Muslim Middle East. But nothing came of the idea. For a decade and a half, relations between the two countries were virtually nonexistent, although Lebanon played no role in the 1967 Six-Day War. But, immediately after the war, because of the weakness of its central government and its proximity to Israel, Lebanon was identified by the Arab world as an ideal base for Palestinian terror. The Cairo Agreement of November 1969 gave the PLO special status in Lebanon, and after their defeat in Jordan in September 1970, Yasser Arafat, the entire Fatah leadership, and its fighting force moved into southern Lebanon. Lebanon became a training ground for terrorists from all over the world. The PLO was able to recruit sympathizers from other terrorist organizations and from the hundreds of thousands of Palestinian refugees in camps across the country. During the 1970s, PLO terrorists carried out hundreds of cross-border attacks into Israel. One of the worst was the “Ma’alot massacre” in which 26 people, including 21 students, were held hostage and killed in a school in the northern Israeli town of Ma’alot. The influx of Palestinian fighters into Lebanon upset the delicate balance between Muslims and Christians in the country and, in 1975, led to civil war. Lebanese Christians seeking to restore the ethnic balance and free the country from growing PLO control looked to Israel for support. The two sides had a common interest: to drive the terrorists from their Lebanese base. Two Christian enclaves supported by Israel were set up in the South. That led to the establishment of the Israeli-backed South Lebanon Army under Maj. Saad Hadad. In 1976, Prime Minister Yitzhak Rabin met with Christian leader Camille Chamoun on an Israeli missile boat off the Lebanese coast to formalize the arrangement. Israel, Rabin promised, would supply arms and training facilities. Two years later, Rabin’s successor, Menachem Begin, upgraded the alliance, promising Israeli air cover if Christian positions were attacked by Syrian warplanes. 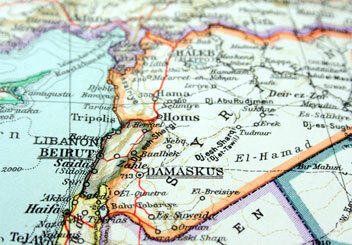 Like Israel, the Syrians had used the civil war to gain a foothold in Lebanon. They had intervened in 1976, first on the side of the Christians, then on the side of the PLO. With close Syrian support, the PLO grew bolder and in July 1981 launched a huge artillery barrage on northern Israel. War was narrowly averted through last-minute American mediation. The cease-fire broke down a year later, when Israel launched Peace for Galilee, an operation designed to drive the PLO and the Syrians from Lebanon and pave the way for a peace treaty with the Lebanese Christian leadership under the charismatic Bashir Gemayel. In June 1982, Israeli ground forces quickly overran PLO positions in southern Lebanon; on August 30, Arafat and the rest of the PLO leaders were forced to leave Lebanon after intense Israeli shelling of Beirut. Gemayel, elected president in July, spoke of peace with Israel, telling Israeli leaders that he would “come to Jerusalem as a second Sadat.” Two months later he was assassinated, presumably by the Syrians, who wanted to pre-empt the burgeoning Israeli-Lebanese alliance, which they saw as a strategic threat. The next day, Christian militiamen moved into the Palestinian refugee camps of Sabra and Shatila and butchered more than 300 unarmed civilians. Israel, which had allowed the militiamen into the camps to seek out Palestinian gunmen, was blamed for the massacre. Throughout the war, the world media had been highly critical of Israel and of its defense minister, Ariel Sharon, who was eventually forced to resign after an Israeli commission found him indirectly responsible for the killings. Still, Israel and the new Lebanese authorities were able to negotiate a peace deal in the spring of 1983. But a year later, under intense Syrian pressure, Lebanese President Amin Gemayel, Bashir’s older brother, renounced the agreement. After the war, Syria moved troops back into Lebanon, and quickly regained its influence over the Beirut government. In the South a new force emerged: Shi’ite Muslims, influenced by the 1979 Khomeini revolution in Iran formed the Hezbollah militia. Israel remained in occupation of a security zone in the South to protect its northern border. That led to an 18-year-long war of attrition with the Hezbollah, in which hundreds of Israelis died. In February 1992, Israel assassinated the Hezbollah chief, Sheik Abbas Musawi, who was succeeded by the present leader, Sheik Hassan Nasrallah. Two major Israeli air operations, Accountability in 1993 and Grapes of Wrath in 1996, followed persistent Katyusha attacks on northern Israel, but had little long-term effect. In May 2000, Israel withdrew from Lebanon to the international border, in a move ratified by the United Nations. Hezbollah moved militiamen down to the border and, like the PLO before them, created a state-within-a-state in the South. In September 2004, the U.N. Security Council passed Resolution 1559, which called for the removal of Syrian forces from Lebanon and the dismantlement of all militias, including Hezbollah. The Syrians and Hezbollah ignored it. But in February 2005, Syria went a step too far, assassinating former Lebanese Prime Minister Rafik Hariri and unleashing a process that eventually forced it to pull its troops out of Lebanon. In the six years following Israel’s withdrawal, Hezbollah, with Syrian and Iranian support, had built up a an estimated force of 12,000 to 14,000 Katyusha rockets capable of hitting a wide range of Israeli cities, towns and villages. Under the Katyusha umbrella, Hezbollah militiamen felt they could carry out cross-border attacks with relative impunity, confident that Israel would refrain from sharp retaliation for fear of triggering a massive bombardment of its civilian population. Moreover, both the Iranians and the Syrians could use the Hezbollah threat to pressure Israel or intimidate their critics in the international community. By mid-2006, the situation had become strategically unacceptable to Israel. And the stage was set for the latest showdown. The Second Lebanon War began on July 12, 2006 when a group of Hezbollah terrorists crossed the border into Israel and attacked Israeli soldiers patrolling the border. The terrorists killed eight soldiers and kidnapped two others. The Israeli government responded with an air-strike targeting Hezbollah positions inside Lebanon, followed later by a ground offensive designed to remove Hezbollah terrorists from Southern Lebanon. Hezbollah retaliated by firing Katyusha rockets at Israeli towns and cities in the North of Israel, at a rate of more than 100 rockets per day for the duration of the conflict. On August 12, 2006 the war ended with a United-Nations brokered cease-fire in which the Lebanese agreed to take control of Southern Lebanon from the Hezbollah with the help of the United Nations.